(Nanowerk News) Nanoscale "cages" made from strands of DNA can encapsulate small-molecule drugs and release them in response to a specific stimulus, McGill University researchers report in a new study. The research, published online Sept. 1 in Nature Chemistry ("Site-specific positioning of dendritic alkyl chains on DNA cages enables their geometry-dependent self-assembly"), marks a step toward the use of biological nanostructures to deliver drugs to diseased cells in patients. 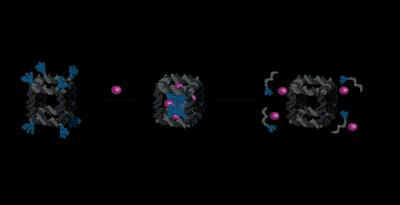 The findings could also open up new possibilities for designing DNA-based nanomaterials. "This research is important for drug delivery, but also for fundamental structural biology and nanotechnology," says McGill Chemistry professor Hanadi Sleiman, who led the research team. DNA carries the genetic information of all living organisms from one generation to the next. But strands of the material can also be used to build nanometre-scale structures. In their experiments, the McGill researchers first created DNA cubes using short DNA strands, and modified them with lipid-like molecules. The lipids can act like sticky patches that come together and engage in a "handshake" inside the DNA cube, creating a core that can hold cargo such as drug molecules. The McGill researchers also found that when the sticky patches were placed on one of the outside faces of the DNA cubes, two cubes could attach together. This new mode of assembly has similarities to the way that proteins fold into their functional structures, Sleiman notes. "It opens up a range of new possibilities for designing DNA-based nanomaterials." Sleiman's lab has previously demonstrated that gold nanoparticles can be loaded and released from DNA nanotubes, providing a preliminary proof of concept that drug delivery might be possible. But the new study marks the first time that small molecules -- which are considerably smaller than the gold nanoparticles -- have been manipulated in such a way using a DNA nanostructure, the researchers report. DNA nanostructures have several potential advantages over the synthetic materials often used to deliver drugs within the body, says Thomas Edwardson, a McGill doctoral student and co-author of the new paper. "DNA structures can be built with great precision, they are biodegradable and their size, shape and properties can be easily tuned". The DNA cages can be made to release drugs in the presence of a specific nucleic acid sequence. "Many diseased cells, such as cancer cells, overexpress certain genes," Edwardson adds. "In a future application, one can imagine a DNA cube that carries drug cargo to the diseased cell environment, which will trigger the release of the drug." The Sleiman group is now conducting cell and animal studies to assess the viability of this method on chronic lymphocytic leukemia (CLL) and prostate cancer, in collaboration with researchers at the Lady Davis Institute for Medical Research at Montreal's Jewish General Hospital.